Before playtesting (of "D&D Next") started I wrote: I don't see how WotC can accommodate fans of 1e/2e and 3e and 4e, because gameplay depth was important to many 1e players, self-expression and one-man-armies was important for 3e (fantasy Squad Leader), 4e is all tactical battles, and variety has become the main interest in 3e and 4e. And now that the public playtesting is done, I'll repeat what I said above. I didn't even see an effort to accommodate such different play styles. The game seemed to be an attempt to upgrade 3e with some 1e/2e, and very little 4e. Am I the only person who is really distrustful of these pre-"reviews" I see on Kickstarter games? This is such an obvious marketing tactic, and the reviews I've seen are so fulsomely (overflowingly?) positive, all of my skepticism receptors light up. 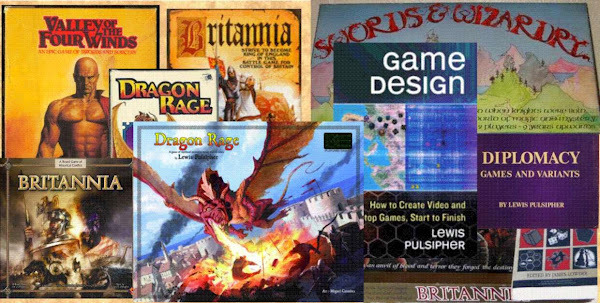 Convergence: The broadest difference between traditional video games and tabletop games is that the former are used to pass the time (or kill time) while the latter are used to spend time with friends - socializing if you will. "New" video games such co-ops, some Wii games, and some MMOs are going toward the "spend time with friends" side. 1) I prefer games of conflict and maneuver. Euro games are usually designed to reduce and deemphasize conflict, and rarely use maneuver and geospatial location. 3) I like games. Euros tend to be interactive solvable puzzles. I like people-watching in board and card games more than I like playing (in part because I gave up playing games against other people when I was 25). If a game is good for people-watching, it probably has lots of interaction; Dominion, for example, is nothing for people-watching, there's nothing to see/hear really. I was looking for a word to compare games where software is needed, to those where it isn't. The former tend to be sports, latter heavily involve the mind. Someone (my wife?) came up with software versus "brainware". Some games require software. Others (e.g. most tabletop) don't use software, just "brainware". Two Kickstarter game groups: one susceptible to/attracted by "smoke and mirrors", the other doing pre-order "P500" via another medium? My video What are you trying to do when you design a level or adventure? : http://youtu.be/NibOtLO9Mwo?a? If I were a professional story-maker I'd never call myself "narrative consultant." Narratives - accounts of what happens - are often not good stories, not interesting unless you're the person it happened to. If you're interested in RPG news, reviews, analysis, look at this near-daily column: http://www.examiner.com/rpg-in-national/michael-tresca? Commodity Game Design - Avoiding Clones. http://gamasutra.com/blogs/AndrewPellerano/20140331/214298/Commodity_Game_Design__Avoiding_Clones.php? My videa about PrezCon2014: http://youtu.be/NkrhVZTJAZI?a? My video from "Learning Game Design" course: What is the player going to do? : http://youtu.be/ugH0Edy21T0?a? These are priced as though they were books, despite being audiovisual courses. There are no discounts. The same courses, when on Udemy, cost about 50% more. Axis & Allies 1941, which appears to have 160 plastic miniatures (five colors), is on sale April 5 for international tabletop day at Amazon for $18.99 (and if your order is over $35 you get free shipping). You might consider this if you need a bunch of WWII plastic pieces for a protoype. Many, many other games are being sold up to 45% off, as well. Acquire for $18.99 e.g.